Paul Karalius, who originally trained a designer, established his career in both the UK and Hong Kong before developing his career in architectural photography. Paul carries out commissions for some of the leading UK and international architecture practises resulting in his work being featured in publications including the UK national press, Architects Journal, Edge Condition and the RIBA Journal. Paul also lectures in architectural photography and mentors photography and design students. His personal projects continue to highlight his interest in cultural spaces and how people interact within them. 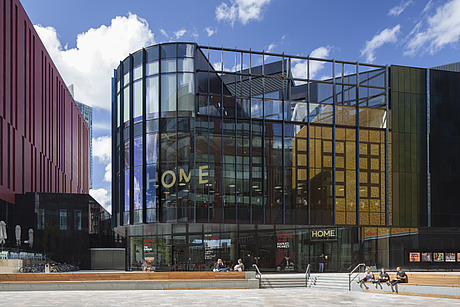 For his profile picture, Paul chose his picture of the HOME arts centre in Manchester: "This image was shot for HOME arts centre and was taken shortly after the construction work had been completed but before the official opening of the venue. My commission, which came directly from HOME, was drawing towards an end and I noticed some of the arts centre staff taking a break from training before the launch. This picture, which was featured in the architecture and national press, remains one of my favourites from the series. It captures the calm before the storm of opening weekend when when 28,000 people visited and the centre officially opened its doors."